At TEDxAlgonquinPark we are inspired by people who Think Outside. In this guest post, Fiona Westner-Ramsay shares how she and her husband Mike made room for their son's autism in their canoe. 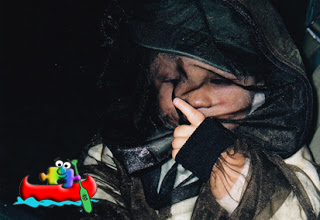 When our son, Makobe, received his diagnosis of autism at the age of two, we really didn't realize just how much our lives were going to change. My husband Mike and I are avid paddlers, but the first time we put Makobe in a canoe he was moving everywhere and not happy with the demand to sit in one area for any period of time. 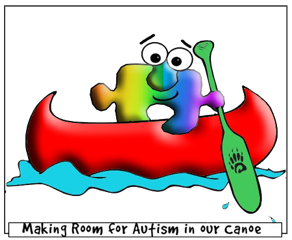 But we were determined to be a family of paddlers and so we spent the next 8 years finding ways to make room for autism in our canoe. Starting with pretending to canoe with Makobe in our living room using our paddles and our ottoman, then in a real canoe with very small 10 to 15 minute paddling trips to start, we eventually worked up to longer trips until we were able to spend a few hours in a canoe with a bit of motivation (usually a swimming spot for Makobe), a number of favourite fidget toys, some edible reinforcement (gluten-free gummy bears or crackers) and visual aids. Because many people with autism learn and are able to understand their world better when they are given visual examples and verbal warnings of what may come, for our visual aids we used photos from our past trips (from before Makobe came into our lives), hand drawn pictures (including some of Makobe's own art) and borrowed a few from the internet as well. At first we used paper visuals but now rely more on the iPad for a quick catalogue of visual aids on the go. 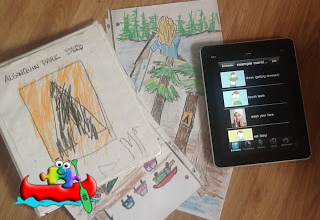 Actually, many families would probably agree one of the greatest, and most affordable, technological advancements for special needs learning and communication came with the iPad and iPad2 (which includes a camera). For those who have come to rely on an electronic device (like an iPad/iTouch/iPhone) for their communication needs or visual aids, a canoe trip may seem a bit impractical. However, with the multitude of choices that are now available for charging devices by way of solar, battery packs or even the new Biolite stove, plus the availability of waterproof and protective covers, the portage has been opened to more of us. But while we are advocates for needs of our exceptional son and the increased quality of life that an iPad brings to our family, we do not use the internet while on a canoe trip. After all, we want our son to connect with Nature while we are in the bush, not YouTube! Interior/Back Country or Car Camping? the sounds that people were making so close to our tent (i.e. talking, walking on the gravel path, shutting car doors, off-key singing around a neighbour's campfire). In fact, when we tried one of the Hwy 60 campgrounds this past summer, it became a complete nightmare for Makobe. We actually had to leave in the middle of the night to calm him as was having a full on panic attack. We returned to pack out our belongings in the morning. Yet camping in the interior is not a problem for our Makobe. With only the sound of the crackling campfire - not neighbours - Makobe is able to settle into sleep in the tent without fear or anxiety. 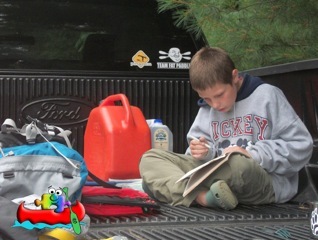 He is much more at home in a more natural camping environment that comes with portaging than he is with driving into a campground and setting up a tent. Another consideration is that there is less chance of autism interfering with a camping neighbour's experience when we are across the lake from them instead of just a few feet away. 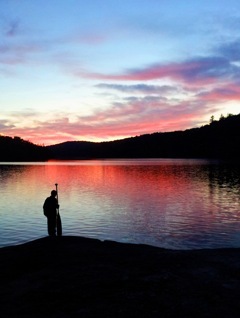 Therefore, it is very important to consider all the aspects of a canoe trip when planning to take a sensory-sensitive person into the interior or backcountry - and practicing anything you think may become an issue at the campsite, before hand at home. Nature has a way of returning peace to one's soul. I always knew there was some truth to this as I have felt it myself on the many canoe trips that I have taken since I was a child. But seeing Makobe, who struggles everyday with the noisy, overly-stimulating modern day world, be able to just sit on the edge of a northern shore and look out at the sky with a calmness that I don't see very often at home, makes me realize that the best thing we ever did was make room for autism in our canoe. Especially since we now know - it doesn't really take up that much room at all! Bio: Fiona Westner-Ramsay is a mother, paddler, and autism advocate with a great love for our natural world. From her parents who offered a wood-working tradition along with a love of paddling and the outdoors, to a husband with which she built an increasingly popular hand-crafted paddle making business - Badger® Paddles, she has even found an artistic outlet, lending creative, custom designs to paddles and much more. Once Makobe was born, Fiona was introduced to Autism, a demanding world with its own set of challenges and rewards. Discovering how difficult it is to find resources for parents of special needs children, Fiona started AutismZeitgeist.com to share the resources she's found with others. Fiona lives and works in Muskoka, ON with her son and husband, Mike, where they can bring it all together, enjoying the outdoors and making room for Autism in their canoe.